New research proves just how big an impact a Lean methodology can have an enterprise’s bottom-line. In the years since Lean first revolutionized the manufacturing sector, the basic principles have also shown benefits in other industries and other departments, most notably within technology. But new research emphasizes the major impact Lean can have not just in your IT departments, but across your entire organization. The ultimate goal and guiding principle of Lean is creating perfect value for customers through a perfect value creation process with zero waste. In the day-to-day implementations of Lean, that translates to creating more value with fewer resources and inefficiencies. Organizations that have implemented Lean are seeing this principle become a reality, according to the Lean Business Report 2016 research from visual product delivery solutions company LeanKit, which surveyed 3,000 executives, consultants and team members between September and November 2015. Of the respondents, 92 percent say implementing Lean has led to moderate to significant improvements in project success. But it's not just at an individual project level where benefits are evident. When asked to list the top benefits of Lean, 51 percent of respondents say Lean has simplified management of team and process complexity, 51 percent say more efficient business processes are the biggest benefit they've seen while 50 percent cite better management of changing priorities. And while 48 percent of respondents say Lean initiatives started in IT, within that percentage, 17 percent say its spread to other departments. And in almost a third of responding organizations, 29 percent, Lean started as an executive-driven initiative, according to the research. "This is about change at an organizational level, which is definitely something CIOs have to think about as it applies to the broader management perspective. 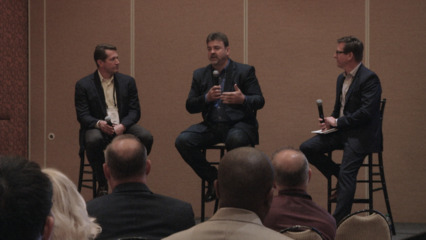 CIOs and other executives have to be shifting the conversation upward from the team level, because there's a ceiling to how much you can accomplish if you're only doing this at a team level," says Jon Terry, co-CEO, LeanKit. Becoming a Lean organization, which 43 percent of respondents say they are, involves a bit of sacrificing short-term results and a commitment to changing everything from hiring practices to compensation and bonus structure to management styles and practice, Terry says. That kind of major shift requires C-level leadership to implement. "To scale Lean above the individual project level, you have to have major cultural shifts. This is not just a permissions thing, where the C-suite says, 'Sure, go ahead and hire a coach and get some training and certifications and we'll be Lean,' it involves trusting your employees to focus on the work and the flow; to say, as a coach and mentor, 'What challenges are you facing? What are the obstacles? Where are the roadblocks?' and then getting those out of the way instead of just being a supervisor," Terry says. It also involves changing things at the HR level, and even extends to areas like compensation and hiring practices, he says. "If you're moving towards a Lean organization that's based on developing and maintaining stable teams of people who build trust, who work together from project to project. That requires changing your org chart. Then, you have to think about removing individual goals and replacing those with team performance goals, which changes compensation as well as what kinds of behavioral and skill competencies you're looking for when hiring - everything has to change," Terry says. The common thread that's driving all this change is adapatability, says Dave West, product owner at Scrum.org. Organizations must become more nimble, agile and adaptable if they're to remain competitive in ever-changing market conditions and fluctuating customer needs and demands, he says. "Ultimately, the intention of any movements like Lean, agile and scrum is to enable more responsive, flatter organizations that have a better ability to compete in a complex and dynamic market. We're all producing products and services into something of an unknown; you take a product to market, but it turns out a different demographic loves it, or it's used in a different way. Then, you have to come back, take that data and rework everything from marketing, sales, distribution," West says. But while such a huge organizational change might seem daunting, the benefits of making the shift to a more Lean organization are well worth it, Terry says. From better management of process complexity to increased team morale, it's evident that the benefits of Lean go far beyond the work itself. Lean helps teams lift the burdens of inefficiency, empowering them to do their best work, according to the research.